An old classic has been given fresh, modern equipment while still allowing the traditional ambiance of downtown to shine. 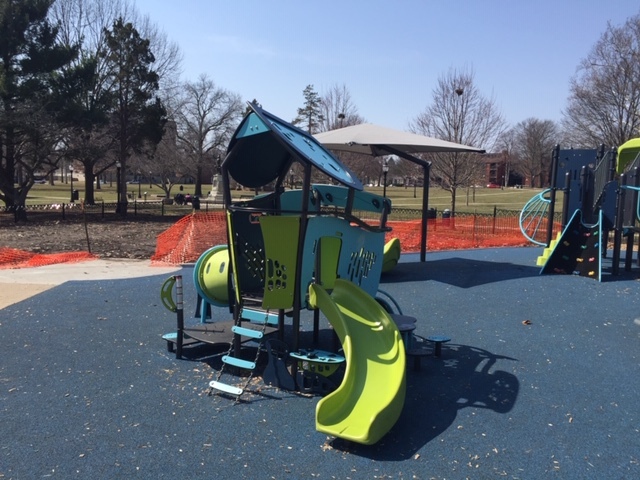 The Champaign Park District has revitalized West Side Park at 400 W. University Ave. 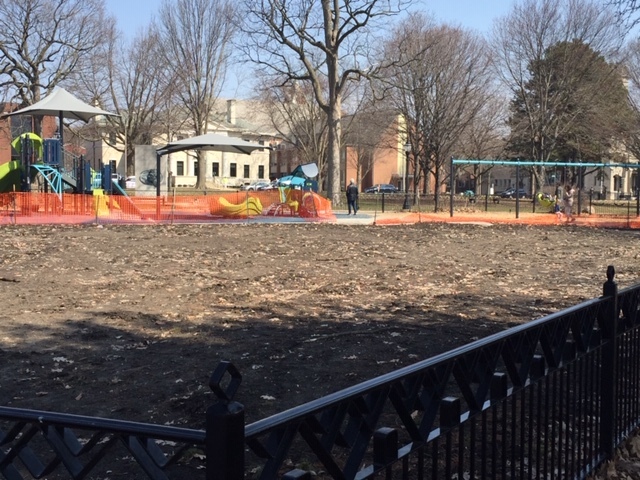 This park sits in the middle of two main streets, West Church Street and University Avenue. In its 13.9 acres, you’ll find lots of sculptures and statues, an iconic fountain, a large pavilion and, of course, the updated playground area. The property was obtained in the mid-1800s and that history is apparent in the property. It looks old, but not rundown old; it’s classic and well maintained. I have vivid childhood memories of the park. It’s one of those places every townie knows, and transplants will learn about. This well-loved park was more than 20 years old, and it was due for a facelift. large trees that provide beauty and shade. gated area around playground. This keeps your littles somewhat contained. The gate will also encompass a larger grassy area. This is simply extra play space! mulch-free play area (except for swings). The padded foundation increases accessibility and comfort/cleanliness. It also doesn’t hold moisture, so if you are playing after a day of rain, no problem. two main structures that cater to different age groups. One is for kids ages 2 to 5, and the other structure is for kids 5 to 12.
accessible merry-go-round and accessible swing. Watch out for the closing latch on the modified swing. It can come down fast. Bring your camera. There’s an amazing “Prayer for Rain” fountain that runs seasonally. It’s a great Instagram shot. Also, the fall brings the most colorful trees. During prime lunch hours, Central High School and neighboring preschool students often use the area. Plan your visit accordingly so that crowds are avoided during school days. Go potty before. There are no bathrooms here. This may not be convenient, but it also makes the spot even prettier. There are no parking lots. This is part of the location’s beauty, however. So bring some change for the plentiful metered parking on University Avenue. This is a downtown area. Be aware that you won’t see just kids and their parents here. There are all walks of life. Yes, very. Like I mentioned before, the playground area has an iron gate around it. Mind you, it’s not like a jail cell. It’s a low, attractive gate that provides a gentle reminder for kids to stay put. There’s also the soft, padded foundation under the structures. This makes the occasional spill much less cry worthy. The smaller of the two structures is designed for 2-year-old kids and older. It has a low-slope slide, steps that are low to the ground, a tube for crawling and hiding, a short climbing wall and musical instruments. All of the features have molded alphabet letters and numbers. There are also peaked roofs on the features. These provide shade for the smaller structures. There are also baby swings. a bridge, dueling slides, climbing wall, three curvy slides and traditional belt swings. Also, the momentum spinner thing that makes you feel like you are going to vomit. an accessible merry-go-round/swing and mulch-free surface. This mulch-free material is also more accessible than mulch. People needing help maneuvering have an easier time on the smooth surface. two, huge shade umbrellas. 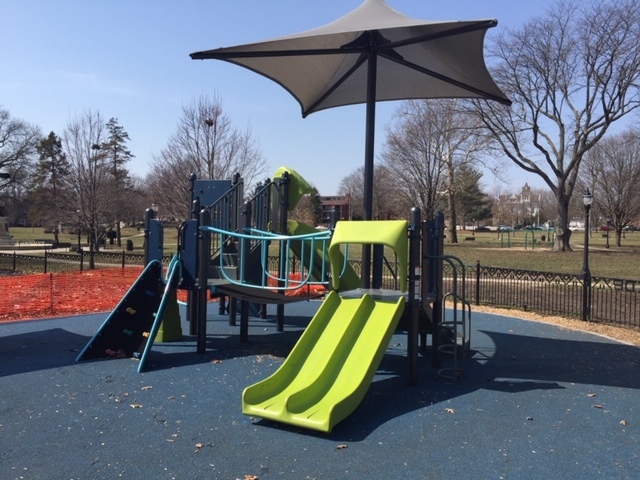 These cover the accessible merry-go-round and the larger play structure. A walking path (.5 miles). Yes. Because of the age of the area, there are huge, mature trees. You’ll find lots of shady spots! Not to mention, the thoughtful shading features of the actual playground. There’s also a huge bandstand/pavilion on the property. You can hide out if you need extra respite. Under trees you’ll find many park benches and tables. There are no parking lots. There is plentiful metered parking on Church Street, heading west. This is a one way— as is the opposing University Avenue, which also features metered parking.